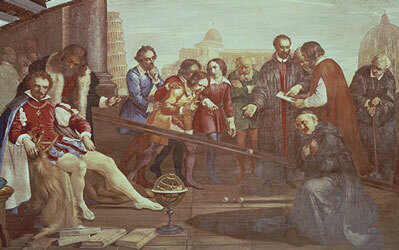 Galilieo's experiments with balls rolling down an inclined plane (early 17th century). 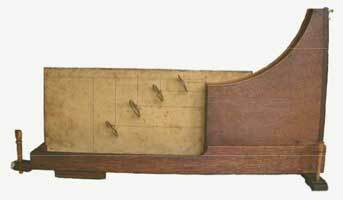 Demo-device by Jan van Musschenbroek (early 18th century). A ball released on the top of the slope on the right will roll down and be launched into a parabolic flight trajectory through four brass rings mounted on the left. 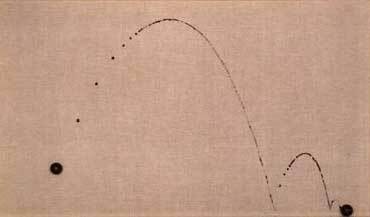 Tom Shannon: Bell Ball (Trajectory Series), 1988. Automatic painting: Tossed wet paint ball rolls and bounces on inclined plane.